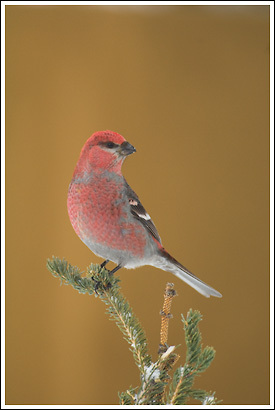 Pine Grosbeak photo, Wrangell - St. Elias National Park, Alaska. Pine Grosbeak photo, Wrangell – St. Elias National Park, Alaska. I was listening to this tune the other day, and this little intro just HAD to go with this image. So, here it is. Sorry for the delay in posts, again. I came in to Anchorage for a few days, and have been sitting, faithfully, at my computer trying to make it start. It locked up during an update, apparently, and then I couldn’t get it to start. I managed to back up most of the data on it, though it took forever. I thought the HD was fried, but it appears no problems there. I’m still working on getting all the programs back up, etc, and it’s taking way too long. I’m about sick of this computer business – I’m ready to head back to the safety of the woods. I’ll take 40-50 below zero temperatures over technology problems anyday. This stuff is too much hassle. I did manage to take a few bird photos in the park before I came back out. They’re tricky little critters to shoot, but lots of fun. This male Pine Grosbeak was pretty cool, and I managed to get a few images. They’re named a ‘pine’ Grosbeak because they do so love the pine or coniferous forests (I spose Coniferous Grosbeak doesn’t sound so cool a name). Technically, they’re not a true Grosbeak, but a large Finch. The scientific name for the bird is Pinicola enucleator, which is pretty fancy. ‘Pinicola’ translates as ‘pine dweller’. They’re one of the few birds who winter this far north .. all the smarter ones fly south to warmer climes. For folks such as my father, you have to click the “play” button located directly under the photo to hear the track that goes with this photo. For folks a little more hip than my dad, you get a prize if you know who the author of the track is; composer, track title, and album, please. No googling allowed. This entry was posted in Alaska, Birds, Wildlife, Winter, Wrangell - St. Elias National Park and tagged Birds, Pine Grosbeak, Wildlife, Wrangell - St. Elias National Park on February 13, 2009 by Carl D.
Sweet image Carl! Surprised it isn’t a white background. I feel your pain when it come to computers! Any guess on the recording? No guesses on the audio there bud, though the guy does sound like he’s had a few. I can’t believe you folks don’t know who this is. Very disappointing. Glad you like the pic, thanks man. Prince, or was it from the artist formerly known as prince period? We HAVE a winner. Well, kinda. Some more information would be expected, but, under the circumstances (it’s winter, cold and gray outside), we’ll accept this raggedy answer. Prince, the funkiest man in the world, from the ‘Rave Un2 the Joy Fantastic’ album – the song is called ‘Pretty Man (with Maceo Parker)’. Now, rather than ask “Who is Maceo Parker”, I’ll tell you: Maceo is a sax player, and he played, prominently, with James Brown, the ‘Godfather of Soul’. His brother Melvin was also a member of Brown’s band, a drummer. Maceo’s awesome. He also played with the rock band, Jane’s Addiction, in 1997 on a song called, oddly enough, “My Cat’s Name is Maceo”. I have to laugh! You guys are nuts! !